Today I welcome Dayton Ward to the site. Dayton is a prolific science-fiction and media tie-in author who has dabbled in Star Trek, 24, Planet of the Apes, The 4400, and other properties. Author Kevin Dilmore is a frequent collaborator (and partner in crime). Dayton is also a regular contributor to StarTrek.com, and has previously written content for Tor.com, Star Trek Magazine, and the blog Novel Spaces. You’ve probably read his Ten For Ward articles on StarTrek.com over the years. I know I have. Everything he writes is professional, honest, and shot-through with his sharp sense of humour—an aspect of his personality I have come to appreciate after befriending him on Facebook several years ago. There’s something that bonds Trek fans beyond the show, the franchise, and that is our combined outlook. It is optimistic, hopeful, and above all . . . human. That outlook is fostered by the concept of Gene Roddenberry’s creation, and taken forward (or, For Ward!) into the real world by us, the fans. Dayton’s latest novel is Hearts and Minds, a Next Generation novel. As I said, Dayton is pretty prolific, so we’re going to talk Trek a little bit before moving onto his other work—and for the writers out there, we’ll be discussing how he and Kevin have made their collaboration work so well, for so long. But first, clear all moorings and take her out. One quarter impulse power . . .
Q: Dayton! I’ve wanted to do this for a while, but I’ve been waiting for the right moment. I know you’re a busy guy. You’re a full-time writer now, so does that mean you’ve always got something cooking? Do you schedule yourself time to rest and refuel now and then? A: I try to always have something to work on, and I do try to schedule things so that I get to enjoy time with family and friends. The thing with freelancing – beyond securing projects in the first place – is balancing your time commitments to your clients. Sometimes, it’s a “feast or famine” situation, where you go from no pending work one day to multiple competing deadlines the next. It was like that for me over the summer. I suddenly found myself contracted to three different clients, all requiring considerable time and energy on my part and with deliverable due dates within a week of each other. Two of the projects were my first for their respective clients, so you don’t want to blow your chance to impress them with your ability to deliver quality content on time. Suddenly that “free weekend” to do something fun becomes the slice of time you need to keep one project from falling too far behind. Q: Your start in Trek came with the short story Reflections in the Strange New Worlds anthology. What do you remember about Reflections, and how did you find yourself writing and submitting a Star Trek short story? A: I’d written a version of the story well before Strange New Worlds, and when that first contest was announced, I decided to take the story and rewrite it in an attempt to polish it and make it look “more professional.” I was encouraged to enter the contest by a friend, and it was my first time ever submitting a piece of writing to be considered for professional publication. I guess it worked out okay. Q: You contributed three stories to the Strange New Worlds anthologies in the end, before moving on to write for Starfleet Corps of Engineers with Kevin Dilmore. How did that series come about? A: Microsoft was developing their version of an e-Book reader way back in 2000, and they approached a couple of the bigger publishers about providing content specifically for this new platform. They approached Pocket Books and the editor there at the time, John Ordover, about the possibility of providing all-new Star Trek stories written primarily for the Microsoft Reader device. John brainstormed some ideas with author Keith R.A. DeCandido, and BOOM! The Starfleet Corps of Engineers series was born. Kevin was interviewing John for an article that would appear in the old Star Trek Communicator magazine, and as they got to talking about the types of stories this new series might have, Kevin pitched an off-the-cuff idea that John liked. At that time, I was in the midst of finalizing In the Name of Honor, my first Star Trek novel for Pocket, but Kevin asked me to help him flesh out his original idea, and that became Interphase, a two-part entry for the SCE series and our first fiction collaboration. Q: The history and world building of Star Trek is now so intricate and detailed, it must take a lot of time and energy to ensure these tie-ins are true to what has come before. Is everything you need to know now readily available on the web, or do you still find yourself referring to the encyclopaedias and reference guides? A: It’s a mix, and it depends on what I’m researching. I own most of the big Star Trek reference books dating back to the 1970s, and my book and comic collection goes back to stuff that was published while the original series was still in production. That said, the web is great as a starting point, and helps to narrow the search field when I’m hunting something obscure. Once I find what I’m looking for, I always corroborate it against the shows or movies themselves, or against whatever reference work or other novel I know has more detailed information on the topic in question. Q: Help us understand how these Star Trek books comes to life. I’d imagine you don’t just sit down, write the novel, then submit it to your editor for approval. Give us a timeline of what it typically takes to get one of these approved, written, and published. A: The process varies in detail from project to project (and writer to writer), but at this point and now that I’ve been doing it for so long, my personal process tends to be starting with a quick pitch – a paragraph or two – to gauge the editors’ interest. Or, they come to me and ask if I have an idea, for example, for “a TOS book” or “a TNG story” or whatever. There are even occasions where they might approach me with a one or two-sentence idea, then ask me something like, “Think you can come up with something along those lines?” That last scenario might happen if I’m being asked to contribute to some kind of multi-book or project, like the Typhon Pact or The Fall miniseries. Even then, it’s usually something vague like, “I want you to write a Picard/Enterprise-E story and it involves the Andorians. Go.” Far more common is me pitching the basic idea, getting a thumbs-up, and then me writing a more involved outline of ten to fifteen pages, which is then reviewed both by my editors at Pocket Books and the licensing group at CBS Consumer Products. Once everybody gives me a green light, I proceed to manuscript and once I deliver that, the approvals process starts all over again. Depending on the book, that process from gestation to publication can take anywhere from 12-18 months, on average. Q: Over the years you’ve written (and co-written) tales set in the Original Series, in the Next Generation. You’ve contributed to Star Trek book series like Corps of Engineers, Typhon Pact, Vanguard, the ‘A Time To…’ series, The Fall, and Star Trek: Seekers. Is there a point in the timeline you’d like to explore? A bucket list Trek project you’d like to get around to writing some day? A: I’ve had this notion of exploring the period between “now” and Star Trek: Enterprise. We’ve hinted at what happens during the early 21st century in a couple of books, and then there are movies like Star Trek: First Contact, of course, but there hasn’t yet been any real cohesive attempt to flesh out that period of 100-125 years or so. I’ve always wanted to do something that is sort of Star Trek’s version of (the novel and film) The Right Stuff and/or (the TV miniseries) From the Earth to the Moon. That kind of thing could keep me busy for a few books, I think. Q: I understand that you’ve written a novel for Star Trek: Discovery. I know you guys have signed an NDA and can’t really talk about the show, or the tie-in, but without giving anything away, it must be a great honour to join David Mack in being the first authors to work with these new characters. A: It is indeed a great privilege to be asked to do something like this. It’s unlike any Star Trek project I’ve ever done, owing to just how closely we’ve worked with people in the show’s writer’s room as the show has been developed. As a fan of Star Trek dating back to the 1970s and decades before I ever thought I might get to write professional Star Trek fiction on a regular, continuing basis, it’s been a literal “Dream Job.” I knew for months before contracts were signed that I’d be writing the second book, and even during that period Kirsten Beyer would call me on occasion to discuss some bit of Star Trek lore or trivia. One of my favorite examples of this is the day Kirsten called me and without even offering a, “Hello,” began the call by saying, “I have a Star Trek emergency.” We’d spend hours on the phone talking about such things, and I knew she was taking bits of these conversations back into the room as they continued to work on scripts. So, maybe in some small way, I may even have contributed to the show’s development. It’s things like that which truly make this job fun. I’m obviously biased, but having watched Discovery come together over a period of nearly two years, I’m excited that we’re finally here, and people get to see what these people have been laboring to bring us. Q: Moving on to writing, how has your working relationship with Kevin lasted the test of time? What’s your advice to writers who are looking to collaborate with one another? Any survival tips? A: There are some segments of fandom that call us the “Star Trek’s longest-running writer bromance.” I even decided to run with that idea for an April Fool’s Day gag. We’ve been collaborating since 2000…almost as long as we’ve been friends. It also helps that we have very similar ideas about what makes for a good story, and in particular a good Star Trek story. We have different strengths and weaknesses when it comes to our individual writing approaches, but we try to use that to our advantage when it comes to dividing the work on a given project. Q: I read your blog, and I’ve seen you mention doing a series of e-books in the vein of the “men’s adventure” novels that were widely available in the 80’s and 90’s. Any traction on that? Is it something you’d self-publish, or find a publisher to work with? A: Right now, it’s just something on the white board in my home office. I have a file with various ideas I’ve scribbled down, along with a few notes on characters and the sorts of stories I might tell. I thought about doing it myself, either publishing it through Amazon or Smashwords or one of those platforms. I’ve even given thought to setting up a Patreon account and doing it as some kind of exclusive content offering via that venue. I really haven’t had much time to give it a lot of thought, as actual contracted work has been keeping me busy. Q: You often contribute to a blog called ‘Novel Spaces’. Is it a good resource for writers of all abilities and experience levels? Q: For writers starting out today, how is it different from when you got your first break . . . and what advice would you offer them? A: Independent publishing has to be the big difference. It used to be that self-publishing was largely frowned upon, and there are still a number of vanity presses out there who will take a new writer’s money and leave them with a shoddy product, assuming they cough up anything at all. But platforms like Amazon have allowed authors of every stripe to bring forth more content on their own. Those willing to learn the entire process of getting a book ready for publication including editing, cover design, promotion, and so on and who have the time to devote to that process can enjoy success with independent publishing. As for traditional publishing, that’s never been an easy road to travel and it seems to get harder all the time. Yes, there are still the success stories of a new writer submitting a manuscript and grabbing a publisher’s attention, but they’re not as prevalent as we’d like to think they are. Writing for a licensed property like Star Trek is even harder. I get a lot of questions about how to break into that type of writing, and the cold, hard truth is that a new writer with no experience is unlikely to land such a project. Editors of tie-in novels work on ridiculous schedules while overseeing multiple books within a given series, and so tend to rely on writers with whom they have a solid working relationship and who they know will deliver clean manuscripts on time. So, writers need to acquire experience and “street cred” elsewhere before they end up on an editor’s radar. Q: I read 24: Trial By Fire and really enjoyed it. I am a big fan of 24, the series, and really felt that you captured that same feel. A big story told with propulsive plotting, and the same classic Jack Bauer we’ve all come to know and love as a character. How did that gig come about? A: I was approached by editor Melissa Frain at Tor Books, who’d gotten my name from another editor, Marco Palmieri, with whom I’d worked on a few Star Trek novels. Melissa had taken on the task of publishing three 24 novels for Tor, and Marco recommended three writers he thought would be well-suited for the job. James Swallow and David Mack wrote the first two books. All three of us are huge fans of 24, and we’ve worked together on a few different Star Trek projects, so there was a bit of a “getting the band back together” feeling permeating all three books. As a fan of the show from the first episode, this was something of a dream gig, so I absolutely signed on. Q: You were a Marine for 11 years. How did your experiences and your training come into play when working on something like 24: Trial By Fire? A: The novel takes place on the island of Okinawa and is set in 1994, several years before the events of the TV show, and Marines feature prominently throughout the story. As a Marine, I was stationed for a year on the island in the late 1980s, so I was able to draw on my knowledge of Marine culture, equipment, and so on as well as the region itself and the various bases that call it home (even though I took a few authorial liberties, here and there). I spent a lot of time going through all the old photos I took during my tour there, looking for landmarks or recognizable locations in which to set certain scenes, and just generally researching the island the way it is today as compared to what it was 25 or so years ago. There were a few times where I realized I was spending an awful lot of time wallowing in memories and nostalgia! Q: You’ve successfully shifted genre, depending on the project. Do you feel it’s easier to do that within the scope of media tie-ins than it is for, say, somebody working from an original concept that is wholly their own creation? A: As with many things in this field, it depends on the writer. I know writers who only like to write short stories, and others who only prefer novel-length works. Some writers only want to write within a specific genre, while others are happy to skip around. As for tie-ins versus original, each presents its own set of challenges, and “rules” by which you have to abide. Original fiction has more prospects for long term success for the writer, but tie-ins are fun and they pay reasonably well, depending on the publisher. I like working on both types of stories, and I don’t tend to have any problems shifting gears or genres. Q: How did you arrive at the story for Hearts and Minds? A: It started with my editor asking me if I had any ideas for a Star Trek: The Next Generation novel to follow the one I was already writing, Headlong Flight. Before that, I’d written two previous TNG novels (Peaceable Kingdoms and Armageddon’s Arrow) and so I had a bit of a thing going with Picard and his crew. I had the scrap of an idea that I’d removed from my original outline for what became Headlong Flight, and as I started playing with it I figured out a way to tie it to a couple of other novels I’d previously written. In fact…..
Q: Am I right in thinking that Hearts and Minds ties into your previous novels From History’s Shadow and Elusive Salvation? A: See how that works? Hearts and Minds concludes something of a loose trilogy that I never intended to write, following up on certain characters and situations introduced in From History’s Shadow. I’d always imagined Shadow being a standalone, “one and done” thing, but response to it was so favorable that I ended up revisiting some of the ideas I’d played with, and that became Elusive Salvation. With those two books, I’d had a lot of fun connecting several continuity dots, and linking events in Star Trek’s future history with real and imagined events from 20th century Earth. The first two books featured Captain Kirk and his crew from the original Enterprise, but for Hearts and Minds I opted to push things into the 21st century while linking to a story with Captain Picard and his crew 300 or so years later. Q: I believe that with every book I write, I should try to explore something new. Whether that’s a philosophical thing, a political view, a moral quandary, or something that relates to me on a personal level. 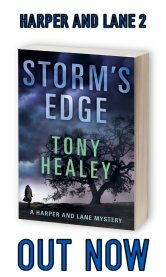 In my latest book, Storm’s Edge, it’s political corruption, and personal sacrifice in pursuit of what’s right. What do you want your readers to take away from Hearts and Minds? And how does that relate to you on a personal level? 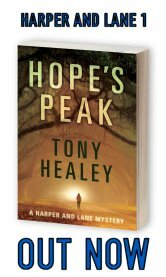 A: The broad theme of all three books is this notion that there’s a “secret history” beneath the surface of actual history, and how that may or may not be a good thing depending on the circumstances. I’ve always been fascinated by the idea of Gary Seven and other agents like him working behind the scenes on Earth—lurking in the shadows of history, if you will—and helping us find our way toward that more promising Star Trek future. However, as with anything else, there’s usually a darker side to keeping these kinds of secrets, and examining whether certain actions are justified or even necessary, let alone legal or moral, is fertile ground for storytelling. As for Hearts and Minds specifically, it was a way for me to show that not only is the road to Hell often paved with good intentions, but also that the path to prosperity and peace is sometimes built upon the sacrifices of the innocent or the unwitting. Q: I think it’s really cool that you’re tying these recent novels together in that way. Are there any plans to continue to explore the concept? A: I’ve learned to never say, “Never,” when it comes to this kind of thing. If I come up with a story that lets me return to what I’ve set up in these three books, I’ll happily do so. Between these books, and Greg Cox’s Eugenics Wars novels, and my own ideas about that period between “now” and Star Trek: Enterprise, there’s a lot of ground to cover. Hearts and Minds sounds awesome! It’s certainly garnering some rave reviews. Now for a few . . .
Q: Favourite novels you think deserve a wider readership? A: Let’s go with Nomad, a page-turner of a technothriller by my friend James Swallow, Martians Abroad, which is a wonderful science fiction novel by Carrie Vaughn, and The Midnight Front, a science fiction/alternate history novel coming later this year by long time friend and colleague David Mack. This book is the first of a trilogy Dave’s writing for Tor Books, and like pretty much everything else he writes, this one will knock your socks off. A: It’s a tie between three Rush albums: Moving Pictures, Power Windows, and 2112. Q: Most under-appreciated movie, in your opinion? A: I don’t know about “most,” but Midnight Run with Robert DeNiro and Charles Grodin. I’m often surprised by how many people have never heard of it, and I think it’s one of the best action comedies ever. I can watch that thing on a loop all day. Q: Is there a TV series you’ve been impressed with lately? A: I enjoyed the first season of Designated Survivor more than I thought I would. I’m a sucker for shows set in or around Washington and the White House. I’m currently watching three such shows: this one, along with Scandal and House of Cards. Q: Who is your literary hero? A: If you mean fictional character, I don’t know that I have a single pick. There’s Cadfael from The Cadfael Chronicles, Slippery Jim diGriz (aka The Stainless Steel Rat), and Andy Dufresne from Rita Hayworth and Shawshank Redemption (the novella, and the movie) to name a few off the top of my head. If we’re talking writers, then wow. Richard Matheson, Arthur C. Clarke, David Morrell…we could be here a while……. Q: Last, but not least, give us a link to your favourite Youtube video . . . Hearts and Minds is out now! I’d like to thank Dayton for agreeing to this interview, and wish him every success with the book. Like everything else he has written, it looks set to be a big hit!